Head of the Imperial Orthodox Palestine Society, Sergei Stepashin, said on Monday that Syria is witnessing an aggression waged by terrorists, criminals and bandits who are using religion to justify their crimes and they become a tool in the hand of foreign parties in order to divide Syria. 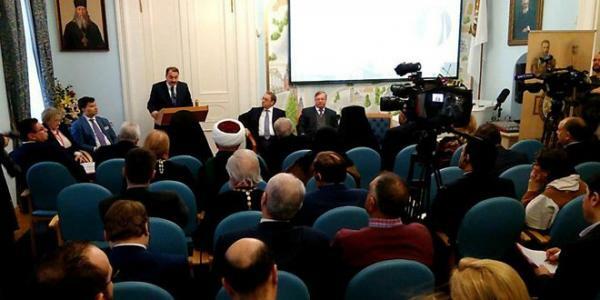 Stepashin statement came during a roundtable meeting organized by the Imperial Orthodox Palestine Society held in Moscow. “The sponsors of the terrorist groups are trying to use different tricks at international circles to condemn the Syrian government under the pretext of using chemicals or shelling civilians,” he added. Stepashin went on to say that supporters of terrorists are putting a pretext of the deteriorating humanitarian conditions in East Ghouta to protect the gunmen who are using civilians as human shields. In turn, Syria’s Ambassador in Moscow, Riad Haddad, thanked all the efforts exerted by the Society through sending aids to the Syrian people and uncovering the terrorist war goals on Syria and its people. The victories achieved by the Syrian army in cooperation with the Russian forces, with the aim of restoring security and stability to a large number of areas, in addition to the announcement of de-escalation areas, encouraged many displaced Syrians to return their homes to rebuild their own country, Russian President’s Special Representative to the Middle East and African Countries, Deputy Foreign Minister, Mikhail Bogdanov, said.